Salads are great. My family likes their salads with a little protein, an extra crunch, and a fresh, sweet touch. Having a salad once a day is definitely a good habit. Of course, having someone chop and prep a salad is even better. I am absolutely loving the ready to eat organic salad kits we find these days. They’re so convenient, with such clean ingredients. Here, I made a tortilla and topped it with the salad and some chicken. It was a complete, delicious meal of Asian Chicken Salad in a tomato tortilla. 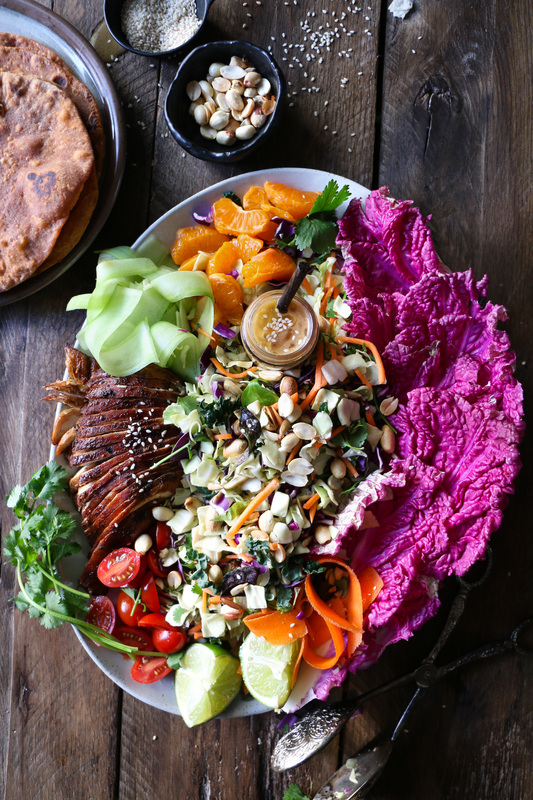 I was glad to partner with TheFeedFeed and Earthbound Farm. I am usually very skeptical about bagged salads and bottled dressings. However, this one defied my expectations. I stand by this brand, and am so impressed with this little kit. It comes with a dressing (which by the way is good), some chips, and nuts. I add this salad mix to my chow mein, omelettes, pastas, and pretty much everything else that I can add vegetables too. I am one of those people who loves salads, although I do get lazy to get the right mix and chopping it. Thankfully, my kids love salads too. Even the picky little one is a such a salad fan. So, this kit is definitely super helpful. I add some protein, some cheese, and it’s ready. These tomato tortillas are so good with some chicken, the salad, and the dressing. 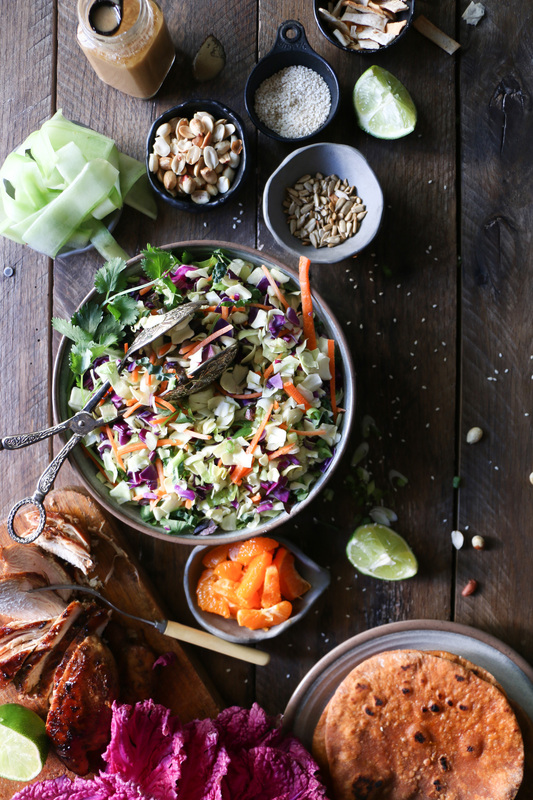 All you have to do is marinate the chicken, grill it, add the salad mix, and this meal comes together under 30 minutes. 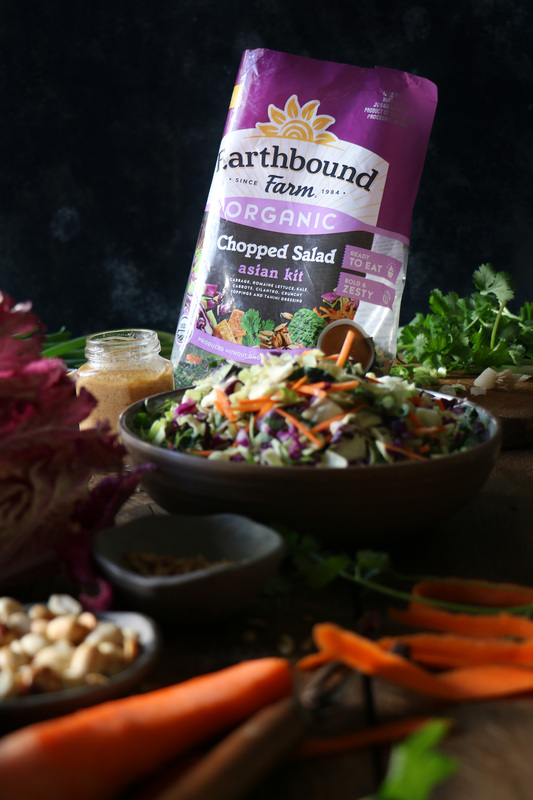 While this recipe calls for the Earthbound Farm Organic Asian Chopped Salad Kit, they also make Southwest and BBQ Ranch - both of which would make great substitutes! In a bowl, add the chicken and everything for the marination. Cover and refrigerate it for 2 hours or overnight. You can grill this, or pan fry it or bake it a 400 degree oven until is brown and cooked. Take it out and wrap it with an aluminium foil so the juices soak in and the chicken is moist. In another bowl, add everything for the tomato tortilla. Add water little at a time and mix it to make a semi soft dough. You can use a dough attachment of the food processor or the dough hook in a kitchenaid to make the dough. Once the dough comes together, knead it for 2-3 minutes until it is smooth. Wrap it and let the dough rest for 10-30 minutes before making the tortillas/rotis. Heat a griddle on medium flame. Divide the dough into equal portions, each has to be a small lime size. Roll it thinly and cook them on the griddle on both sides until they are blistered and cooked. Rub some butter on it to keep them moist. Wrap them in an aluminium foil or kitchen towel until you are ready to use. Take a taco, add few slices of chicken, the salad, some orange slices, cucumber and generous drizzle of the dressing.